The A-4 Skyhawk was designed by Douglas Aircraft’s Ed Heinemann in response to a U.S. Navy call for a jet-powered attack aircraft to replace the A-1 Skyraider. Heinemann opted for a design that would minimize size, weight, and complexity. The result was an aircraft that weighed only half of the Navy's specification and had a wing so compact that it did not need to be folded for carrier stowage. The diminutive Skyhawk soon received the nicknames "Scooter," "Bantam Bomber," and, on account of its nimble performance, "Heinemann's Hot-Rod." A distillation of all the best features of preceding Skyhawks, the A-4M was easily the most capable model, as well as the most powerful by virtue of the J52-P-408A which generated 11,200 lbs (5,080 kg) of thrust. A square-capped fin, similar to that of the A-4H/K, later provided a convenient anchor point for ECM equipment and the A-4M also introduced a much revised canopy giving enhanced all-around vision. A “bent” flight refueling probe was fitted to minimize interference with the radar, and the aircraft had a braking chute, additional ammunition capacity (at 200 rounds per gun, exactly twice that of its predecessors), self-start capability, a new gunsight and a ram air turbine for emergency power supply. The A-4N was built in response to an export order from Israel in the 1970s. 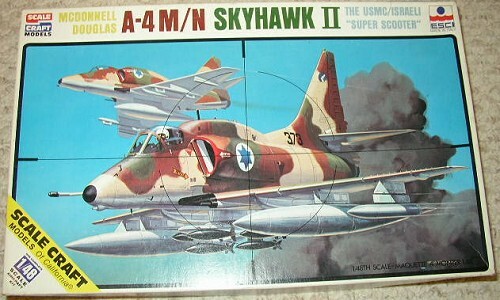 Israel’s A-4N was basically similar to the A-4M, but featured a much revised navigation/attack system. Key elements of this were a Lear-Siegler digital computer, a Singer vertical platform and an Elliot Automation head-up display (HUD) unit. The A-4N was produced in concert with the A-4M. 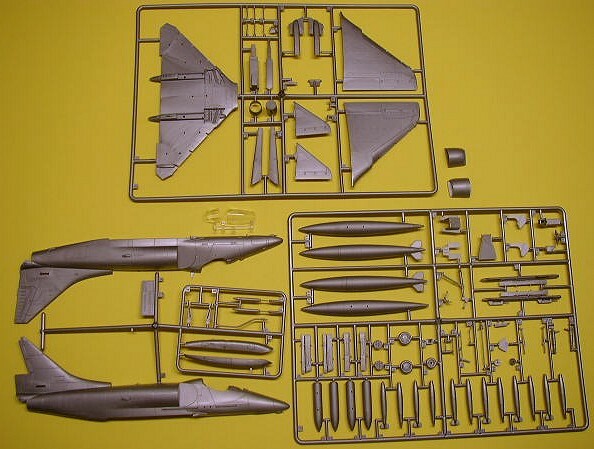 Upon opening the box, you’re presented with three sprues of parts. 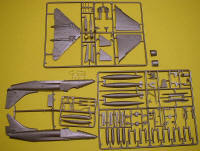 A separate sprue contains the three clear parts. All parts are molded in silver. While the overall detail is very good, there is an odd mix of engraved and raised panel lines. The fuselage is engraved but the wings and stabilizers have raised detail. The cockpit is a bit basic, with the instrument panel and consoles consisting of decals and the seat not having very much detail. The fuselage plastic is thick with a grainy texture, and has somewhat overdone engraved detail. Landing gear detail is very nice and the wing slats can be positioned in the open position. There are no problems with ejector pin marks or flash. The clear parts, while a little thick, are nicely done, although they don't include the correct bulbous canopy for the N version. The extended infra-red suppressing tail pipe, sometimes seen fitted to the N version, is not included. The kit includes the Mk. 12 20mm cannons as well as the DEFA 552/553 30 mm cannons. A nice selection of 'things under wings' is provided, including two 300 gallon drop tanks, six Mk. 82/500 lb. low-drag bo mbs, and two LAU-3/19 rocket pods. The kit instructions also recommend 20 grams of nose weight to keep the model on its nose. 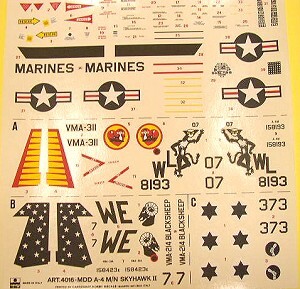 Decals are well printed and semi-matte, and, assuming they hold together due to their age, should work well. Notwithstanding the mix of engraved and raised panel lines, this is a nice kit, that, with a little bit of extra detailing, can be made into an impressive looking model.